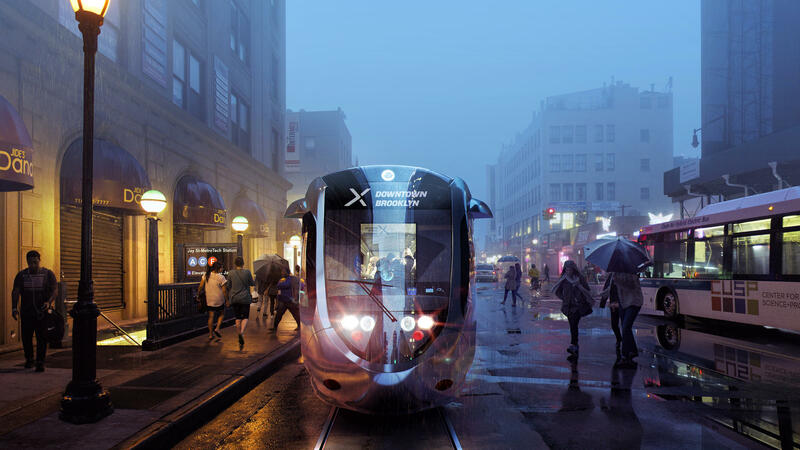 New York Mayor Bill de Blasio recently unveiled details of his plan to build a streetcar connecting Brooklyn and Queens. 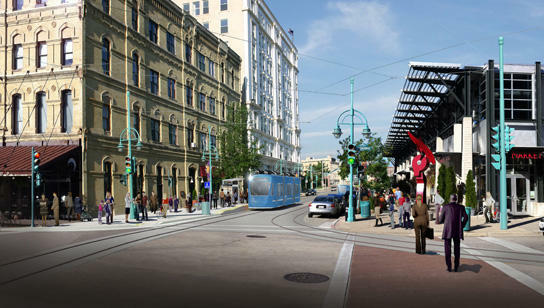 Above is a rendering of the proposed streetcar line. 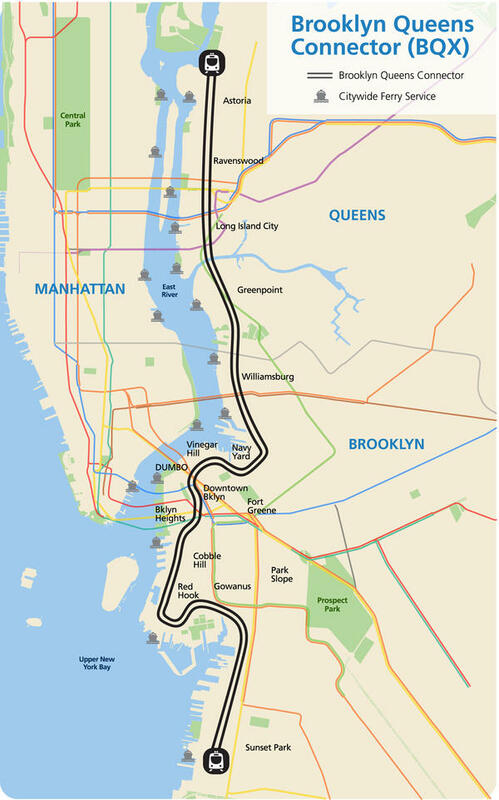 The Brooklyn-Queens Connector is a 16-mile-long streetcar line that will cost $2.5 billion to build. A streetcar approaches Edgewood Avenue in downtown Atlanta. 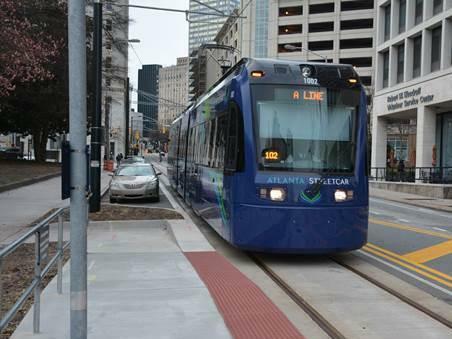 Atlanta's streetcar system opened in 2014. Ridership has been disappointing, and the system is seen as too slow to be useful. "There's only really one way into Red Hook, and that's it," says Jackie Soto, who lives in one of several big public housing developments in the neighborhood. "We only have the buses that come in and out." Soto says it's a long walk to the nearest subway station and the buses are slow. Another resident, Nicholas Aviles, says he'd rather walk to his job than take the bus. He says he would love to see more public transit options to connect Red Hook with the rest of the city. "It is a good idea ... right now I'm walking to work all the way over there," he says. "I could be taking that to work." That's exactly what New York Mayor Bill de Blasio has in mind. This month, the mayor unveiled some details of his plan to build a 16-mile streetcar connecting waterfront neighborhoods in Brooklyn and Queens, including some of the fastest-growing parts of the city. "This will create connections between many neighborhoods, it will connect them all to each other in a way that's never been true before," he says. "Every time we give people more options, it not only makes their lives better, it gives them more access to jobs, it makes their commute shorter." 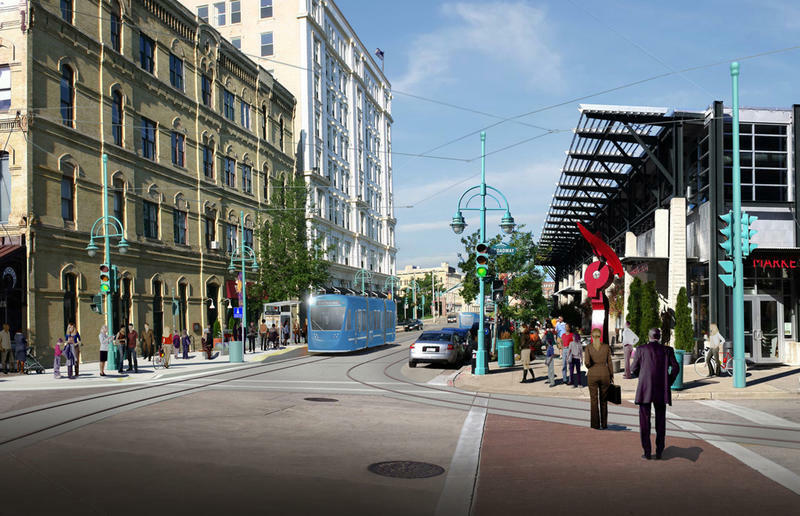 The $2.5 billion plan has the backing of some public transit advocates and some prominent real estate developers whose property values will rise if the streetcar gets built. But not everyone is on board. "This isn't really a mobility enhancing technology," says Marc Scribner, a research fellow at the Competitive Enterprise Institute in Washington, D.C. "This is a government subsidy to property developers." He points to other streetcar systems around the nation that never got up to speed — including the D.C. Streetcar, which is set to begin carrying passengers this weekend after years of delays. For months, empty cars have been rolling up and down H Street in an extended safety test. Scribner blames the troubled rollout on poor planning by the city. "Part of the problem is, you're dealing with bureaucracies that really didn't understand what all went into this. And then part of the problem is it's just inherent with the technology," Scribner says. He says streetcars are hard to maneuver in traffic. Any streetcar that has to share the road with cars and buses is inevitably going to be slow and unreliable. He points to Atlanta's streetcar as an example. That system opened in 2014. Ridership has been disappointing, especially since it started collecting a fare earlier this year. Some riders complain the streetcar is just too slow to be useful. "Sometimes it is a little quicker to walk," says Atlanta resident Amber McQueen. She commutes on the streetcar anyway, but she is surprised at how few other riders she sees. "I'm really trying to figure in my mind how are they able to operate it with so little traffic? It's not a lot of people who use it," McQueen says. Even public transit advocates are having their doubts. Jarrett Walker, a transportation consultant in Portland, Ore., says while the city's streetcar spurred major investments downtown, it has not lived up to the hype. Portland is widely credited with launching the streetcar revival more than a decade ago. "Streetcar is one of those really problematic words because the real estate industry loves it. But more and more, transit advocates are looking at what's been built in the name of streetcar revival and saying no, this isn't durable, long-term, great public transit," he says. Transit officials in New York say they have learned from problems in other cities. They say the proposed streetcar in Brooklyn and Queens will have its own dedicated lane for much of its length. If it doesn't, skeptics warn that New York may be starting down a road to disappointment. Streetcars are rumbling back to life in cities across the country from Portland, Ore. to Salt Lake City to Atlanta. 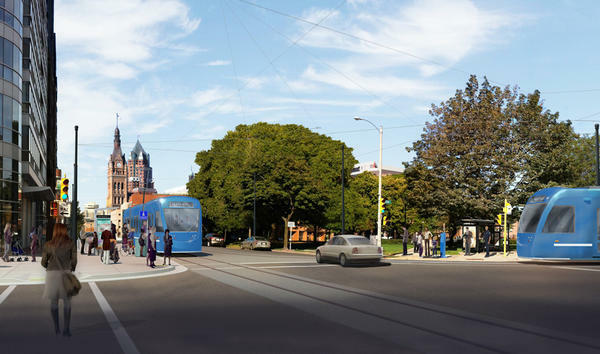 Critics say many of those new streetcar projects are running into unexpected roadblocks. NPR's Joel Rose reports from New York, where city leaders have proposed a multi-billion dollar streetcar to connect Brooklyn and Queens. JOEL ROSE, BYLINE: On a map, Red Hook looks like a little elbow of land jutting out into New York Harbor. It doesn't seem far from the rest of Brooklyn, but it's cut off by water and a major highway. JACKIE SOTO: I mean, Red Hook is isolated. ROSE: Jackie Soto lives in a big public housing development, one of several in the neighborhood. She says it's a long walk to the nearest subway station. SOTO: There's only really one way into Red Hook, and that's it. We only have the buses that come in and out. ROSE: But Soto says those buses are slow. Nicholas Aviles says he'd rather walk to his job than take the bus. Aviles would love to see more public transit options to connect Red Hook with the rest of the city. NICHOLAS AVILES: It is a good idea 'cause, like, right now, I'm walking to work all the way over there. I could be taking that to work. You know what I'm saying? ROSE: That's exactly what New York Mayor Bill de Blasio has in mind. This month, de Blasio unveiled some details of his plan to build a 16-mile streetcar connecting waterfront neighborhoods in Brooklyn and Queens, including some of the fastest-growing parts of the city. BILL DE BLASIO: This will create connections between many neighborhoods. It'll connect them all to each other in a way that's never been true before. Every time we give people more options, it not only makes their lives better, it gives them more access to jobs, it makes their commute shorter. ROSE: The $2.5 billion plan has the backing of some public transit advocates and prominent real estate developers whose property values figure to rise if the streetcar gets built. But not everyone is on board. MARC SCRIBNER: This isn't really a mobility-enhancing technology. This is a government subsidy to property developers. ROSE: Marc Scribner is a research fellow at the Competitive Enterprise Institute in Washington. He points to other streetcar systems around the nation that never got up to speed, including the D.C. streetcar, which is said to begin carrying passengers this weekend after years of delays. For months, empty cars have been rolling up and down H Street in an extended safety test. Scribner blames the troubled roll-out on poor planning by the city. SCRIBNER: Part of the problem is you're dealing with bureaucracies that really didn't understand what all went into this. And then part of the problem is it's just sort of inherent with the technology. ROSE: Scribner says streetcars are hard to maneuver in traffic, so any streetcar that has to share the road with cars and buses is inevitably going to be slow and unreliable. And he points to what's happening in Atlanta. UNIDENTIFIED WOMAN: Welcome aboard the Atlanta streetcar bound for King historic district. ROSE: Atlanta's streetcar system opened in 2014. Ridership has been disappointing, especially since it starting collecting a fare earlier this year. Some riders complain the streetcar is just too slow to be useful. AMBER MCQUEEN: Yeah, sometimes it is a little quicker to walk. ROSE: Atlanta resident Amber McQueen commutes on the streetcar anyway, but she's surprised at how few other riders she sees. MCQUEEN: I'm really trying to figure out in my mind how are they able to operate it with so little traffic? It's not a lot of people who use it. ROSE: Even public transit advocates are starting to have their doubts. Jarrett Walker is a transportation consultant in Portland, Ore., the city that's widely credited with launching the streetcar revival more than a decade ago. Walker says Portland's streetcar did spur major investment in downtown but as transportation, it hasn't lived up to the hype. JARRETT WALKER: Streetcar is one of those really problematic words because the real estate industry loves it. But more and more, transit advocates are looking at what's been built in the name of streetcar revival and saying no, this isn't durable long-term, great public transit. ROSE: Walker's advice to New York and other cities that might be considering a new street car line is to make sure it doesn't have to share a lane with other traffic. Without that, he thinks New York may be starting down a road to disappointment. Joel Rose, NPR News, New York. Transcript provided by NPR, Copyright NPR.